In a small saucepan, melt butter over medium heat. Stir in flour until smooth; cook 1 minute. Gradually whisk in milk, mustard, salt and pepper sauce. Bring to a boil, stirring constantly; cook and stir 1-2 minutes or until thickened. Reduce heat to medium-low; stir in cheeses until melted. Transfer to a large bowl. Separate eggs. Place egg whites in a medium bowl; let stand at room temperature 30 minutes. Meanwhile, in a small bowl, beat egg yolks until thick and lemon-colored, about 4 minutes. Stir in 1/3 cup hot cheese mixture; return all to remaining cheese mixture, stirring constantly. Cool completely, about 30 minutes. Preheat oven to 325°. Place eight ungreased 8-oz. ramekins in a baking pan. With clean beaters, beat egg whites with cream of tartar on high speed until stiff but not dry. With a rubber spatula, gently stir a fourth of the egg whites into cheese mixture. Fold in remaining whites. Transfer to prepared ramekins. Add 1 in. of hot water to baking pan. Bake 40-45 minutes or until tops are golden brown. Serve immediately. 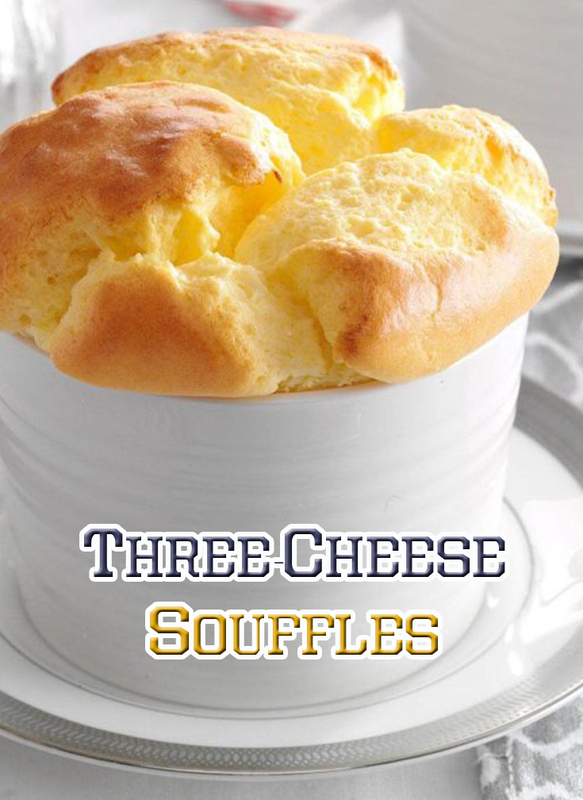 Freeze option: Securely wrap unbaked souffles with foil and freeze. To use, preheat oven to 325°. Remove foil and place frozen souffles in a baking pan; add 1 in. warm water to larger pan. Bake 60-65 minutes or until heated through and tops are golden brown.